Finally weekend has arrived and it is time for a new project. 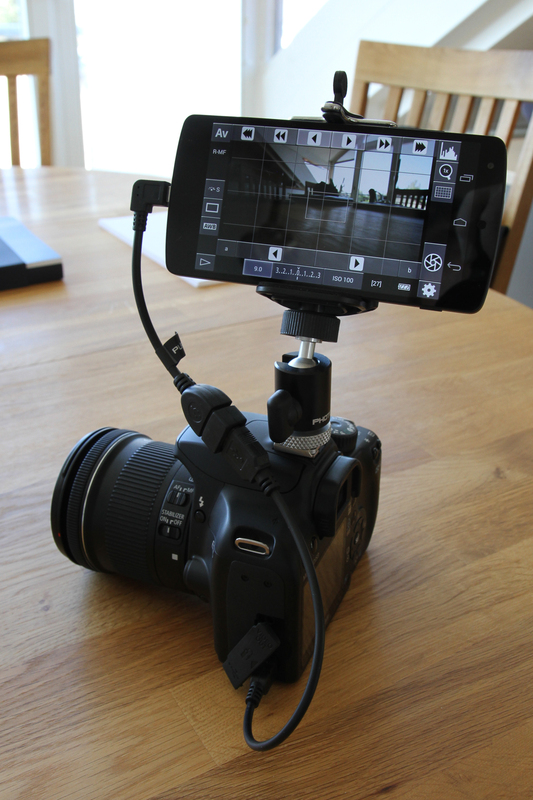 I recently found an App for Android called DSLR Controller allowing the smartphone to operate the DSLR camera remotely. The App can be purchased in the Google Playstore for around 7 EUR. The connection between both smartphone and camera is either established via USB cables or WIFI, if integrated in the camera. As neither my Canon EOS 1000D nor the EOS 7D include WIFI, I went for a connection via USB. I have learned that the type of USB Cable is crucial. A regular USB cable won’t let the smartphone detect the camera. 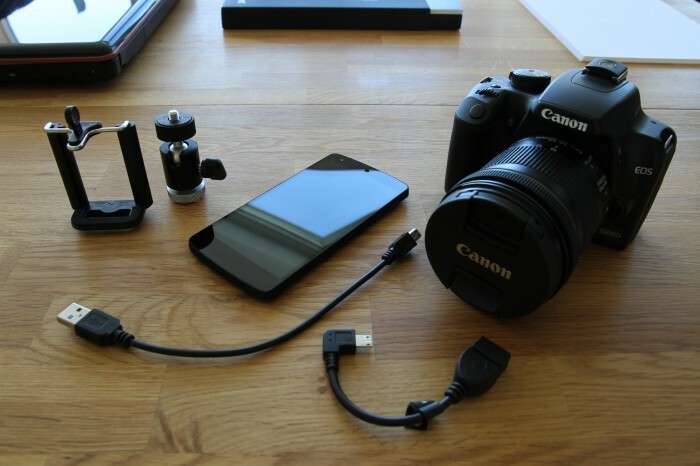 A cable must have a special characteristic to let the smartphone act as a host and the camera act as client. 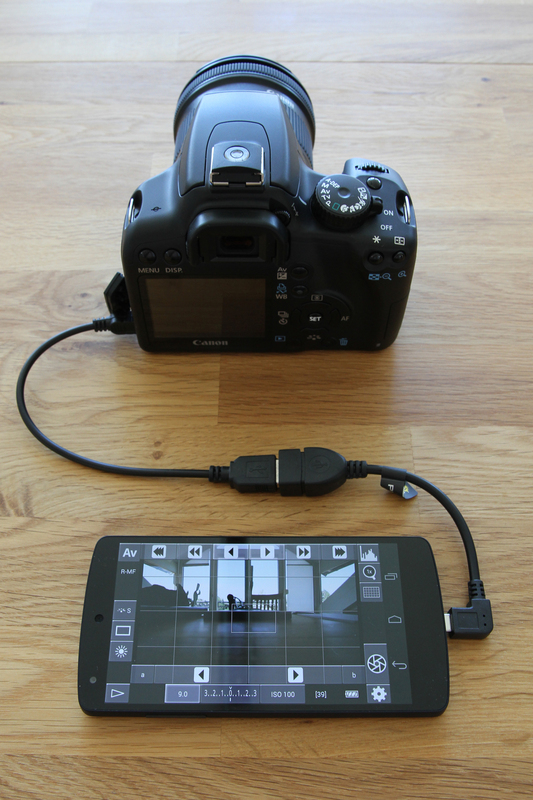 A USB On-The-Go cable is therefore required and I found that the Pure² High Speed Micro USB OTG Cable – also around 7 EUR on Amazon – worked just fine to connect my Google Nexus 5 with both DSLRs I have in my equipment. Another regular USB cable is used to connect the type A receptable from the OTG cable with the DSLR. With a compatible camera connected, the App will start and both smartphone and camera begin to communicate. The DSLR automatically goes into Live-View mode and the smartphone displays the live image. My first impression is that DSLR controller is definitely a powerful and great tool to operate my cameras. I can’t wait to use this setup on the next occasion in order to get some HDR photos with several additional exposures and I will probably attempt to shoot some time-lapse scenes. Here is a picture of my setup fully assembled. I just purchased DSLR controller. I have a Canon 5D Mark ii DSLR camera and a Samsung Galaxy note 10.1. I am using the original Canon USB lead with a Tech Gear OTG cable. From reading the DSLR Controller compatibility list my Canon 5D Mark ii and Samsung Galaxy Tab 10.1 are compatible with DSLR Controller. Can you tell me what I need to do to make the program work? Hi Danny, thanks for your comment. Good to hear that you purchased the DSLR controller software. Unfortunately, while I was experimenting with DSLR controller a while ago, I haven’t encountered the error message that you currently see. Therefore, I have not looked into any possible solution. I’d therefore recommend you contact the software provider directly for troubleshooting.